Once again it’s time to learn a bit more about managing and marketing a successful blog. I’m not a blogging expert yet, but I have learned so much about blogging already. Plus I have about a decade of website marketing experience. Although I offer blog marketing services and SEO analysis for a fee, I am more than happy to share some of my secrets with fellow bloggers in this weekly series. If any of these tips help you, please share them socially. It would be much appreciated. 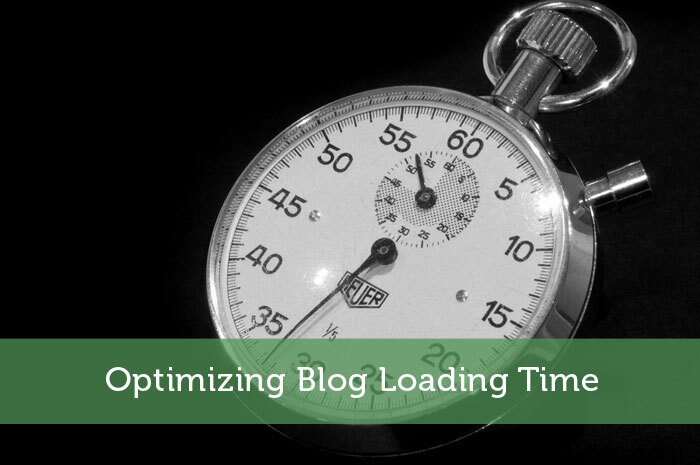 This week the focus is on optimizing blog loading time and why it’s important. This tip is crucial for both search engine optimization and retaining visitors. As with anything in SEO there is some debate over how important loading time is for search engine rankings. Personally I’m pretty sure that a slow loading time can hurt your rankings. Conversely it makes sense that they would reward fast loading sites. Basically it is beneficial to the search engines for the high ranking sites to load nice and quick. If they load slowly, it may reflect poorly upon the search engine. Also, if a company is willing to spend resources properly optimizing a site for load time and using a quality web host, it is a sign that the site should be more trustworthy. Most SEO professionals also believe that user metrics such as bounce rate are considered when ranking websites. If your blog loads too slowly, there is a good chance that it would negatively affect your bounce rate. Face it, people are more impatient than ever and they want things right away. So even if you aren’t too worried about SEO, you should be trying to make your blog load quickly to keep your visitors happy. There are various websites and software to measure the loading time of your blog, but many of those won’t tell you what a suitable loading time is. If SEO is important to you, I suggest you use the Google PageSpeed Insights tool. The PageSpeed tool will give your blog a score out of 100 for how well it appears to be optimized to load quickly. I like to aim for at least 80/100, although some SEO pros just believe a low score would hurt your rankings and that a high score does not directly affect rankings. I believe it could help rankings indirectly though. Besides, I don’t like to leave potential SEO factors to chance since the Google rankings algorithm is always changing. Just keep in mind that improving loading time alone is unlikely to boost your rankings unless it is a major problem. It is one of the many hoops that you have to jump through to get lots of search engine traffic. Within the PageSpeed tool it will list many different areas that you can address to improve your PageSpeed score. Honestly though, unless you have a technical background, it will be tough to understand the issues listed and even tougher to actually address them. If your score is below 60 you may want to hire someone to help you out with optimizing your PageSpeed score. That isn’t my specialty, but I might be able to refer you to someone if you’re stuck. Quality Web Hosting Company: The company you choose to host your blog with is of utmost importance. I’ve used many hosts over the years, but have stuck with HostGator since they have been very reliable. A web host with outdated hardware or mismanaged servers can really slow down a website. Worse yet, it may lead to frequent outages which is a red flag to search engines. Optimize Your Images: Ideally you’d have a graphics program such as Adobe Photoshop that allows you to ‘Save For Web’. Be sure to manually resize images beforehand instead of resizing them with html. For most images, you’ll want to save them as jpg. If your image has very few colors, saving as a gif would likely result in a lower filesize. Optimizing Image References: When you add an image to a post, your sidebar or elsewhere, you should remember to specify image dimensions like this: width=”100″ heigth=”100″ (with your actual dimensions instead of 100). Also try to host all of your blog images on your own server. If you reference an image hosted somewhere else it can add extra loading time. Limiting Excessive Plugins: Over the life of your blog you’ve probably found all kinds of different plugins to enhance your blog. The problem is that each of those blogs is likely slowing down your blog a bit. If possible remove some plugins that you don’t really need. The same could be said for any extra images or ads that aren’t necessary. Installing a Caching Plugin: To limit the number of times that your database needs to be accessed, you should install a caching plugin. I’ve been using W3 Total Cache, but there are lots of different plugins you can try. Optimizing Your Database: Over time your database can get rather bloated and inefficient. To help resolve this problem, I suggest you install 2 plugins: Revision Control and WP-DBManager. Revision Control will allow you to limit how many different revisions of each post are kept. WP-DBManager actually optimizes and repairs your database. There is a lot more you can do to improve the loading time of your blog, but this should give you a good start. Hopefully that wasn’t all too overwhelming. You can still run a successful blog without this kind of technical knowledge, but you should find someone who can help out when needed. Feel free to reach out to me with any questions. Anyone care to share their PageSpeed score? I think mine is 86/100. Is there anything else you would recommend to improve loading time? Is there something I recommended that you just didn’t realize? Ooo I like this post! I’m not going to tell you what my initial score was, but I WILL tell you what it is once I get it optimized. lol so secretive Jordann. I suspect a lot of blogs would be at the 50-60 range if they’ve never looked into this kind of stuff before. I made some additional improvements last night and I’m now at 88/100. Thanks so much for this! I got my score to a 94! Very impressive Maggie. That is a very good pagespeed score. You are a big help for the technical stuff! I tried some of your Twitter tips last week. My page speed score was 85! Yeah – I win! I’m also using the W3 Total Cache plugin. When is the post about Keywords? Nice PageSpeed score MMD! I suggest you move your banner ads over to your own server too though. That would probably bump you up even further. I do plan on doing a blogging tips post about keywords eventually. There are just so many good topics to cover first. Really a blog needs to be properly optimized to get the full benefit of choosing good keywords anyway. Great post. I think the majority of the load times will be the same on “shared” hosts, unless you have a dedicated host and are paying $100+/month for hosting. The other thing that slows down page load times is plugins, the more hard-code, the faster the load times I think. Being on a shared host does affect things, but it depends on which hosting company you use. Some will overload each server to the point that it does get slowed down. The better companies will spread the resources out more and use better hardware to still provide fast loading. I don’t think any blog needs to be paying for dedicated hosting unless they have extremely high traffic. There are a whole lot of factors that affect load time beyond hosting and plugins. I just checked your PageSpeed score and it could probably use some work. In particular, you should be manually resizing those images in the featured posts at the top. Those are massive image sizes considering they are thumbnails. Great post. I assessed my speed a little while ago and made a few changes. It loads really quick now. It is so important to keep readers. I think a lot of people just assume that with the prevalence of high speed internet that loading time isn’t as important now. Really though people expect things even quicker now. You don’t want loading time to hold back your SEO either. I will have to look mine up tonight. Alexa say mine is 1.9 seconds which is pretty slow I think. I will be doing a blog redesign soon hopefully and will work on my load time then. Actually your score isn’t too bad since you don’t use images in posts. That’s a tradeoff in my opinion though. Still your score could be much higher with some minor tweaks such as hosting the yakezie ad on your own server. Sweet post. Mine was 81/100! I think I need to focus on using better-sized images. I am learning a lot about SEO and I never really intended to. Awesome of you to share. Pretty good score Erika. To improve it further, try to manually resize images and host all images on your own server. I bet your header would be a smaller filesize as a gif image too. There’s no time like the present to optimize your blog. Early on you don’t want to be turning off visitors with a slow loading time either. It’s not just for when you’re more concerned about SEO. Plus knowing this stuff early on helps you develop good habits with keeping everything optimized. It’s much easier than going back and trying to optimize all your old images and posts. Load speed is so important. When it comes to optimizing images, I also am a fan of Lazy Load, which uses Ajax to only load images that are visible on the screen. It makes for a very quick initial load. I’ve never heard of Lazy Load. I may have to look into that. I would think that most of the images that my blog loads are visible though. The only ones that aren’t would be the mouseovers for my social media buttons, but I don’t want those to not load. Awesome article. So many people don’t understand the importance to how fast your website loads. Yes load time is very important. Even if you think your blog loads fairly quickly, it is worth taking the time to check your PageSpeed score. You could be missing out on some extra optimization strategies to employ. Ooo nice, I had no idea about page load speeds and I just check mine. 91, not too shabby, Thanks for the tip! Hey Jeremy..good post…..I use WP-Super-Cache for caching..it makes a huge difference. I know my related posts and social plugins slow things down though.. I try to keep plugins to a minimum. I think that is the caching plugin I was initially using but if I recall correctly it was causing some problems with trying to cache my footer toolbar. I got an 85/100 which I’m pretty stoked about! Thanks for all of these great blogging tips, Jeremy. This “series” (maybe you’ll continue it forever?) of tips really helps and I love the Google tool you provided. P.S. (not intentional) I’m glad that we’re still going strong with the G+ shares. Thanks for continuing to participate with that. I wish I could find more people to do the same! No I don’t think I’ll continue this series for too long. I’ll probably run out of topics in a few months. Besides, once I sell out, the masses won’t care about this kind of stuff. Nice work on that score though. My goal is to get at least 90 tonight. Another great post Jeremy! I’ve bookmarked this so I can come back and go through it at my leisure – as well as the other great links in this! Thanks. I try to make these blogging tips fairly helpful, especially for all my blogger friends out there. I want you all to succeed because you’re all great people, but also because the better each of us does, the better we do as a group. If you have pissed anyone off with your loading time, you’ve made up for it with great content. Never mind. It is there now. Ahhh! More awesome tips, thanks Jeremy! My loading time is not optimal (but close), probably because I use HTML for image sizing and a lot of them are not locally hosted. I’ll see if I can correct that to improve my score. Also going to look into database improvement! The other downside of html resizing is that it often distorts the picture a bit. Manual resizing is better for filesize and appearance. Hosting the images locally is important unless you can afford a content delivery network subscription. Each server you add to the equation is another small delay. I’ve been stuck at ~90 for the longest time, but I know there are gains that could be made from there. Currently working on a complete, line-by-line overhaul of my food blog’s theme to try to squeeze some gain out of there. Regarding plugins, not only do they slow down your site just by being extra software, but many aren’t particularly well written either, with regards to site load optimization. Many plugins that utilize images don’t specify the image dimensions. The social media widget plugin I use didn’t. I edited the plugin I use to do so and even shared the code with the developer but he hasn’t implemented it. If you’re already at 90 don’t worry about it too much. That’s a good score. I think it’s what I’m at now after some minor tweaks yesterday. Some deductions are unavoidable if you want to use certain plugins. I also tweaked some of my plugins a bit to remove some validation errors and pagespeed hiccups. Yeah unfortunately you just have to accept some bottlenecks. It just isn’t feasible to fix some things. With my blog one of the things slowing it down is the facebook & twitter plugins. So when search engine traffic becomes a bigger priority, I may have to change those up. Mine’s at 82. I think I can work on it though to get it up to 90. I like how it’s points out some tips in order of priority. Great article Jeremy! Thanks for the outside help you’ve provided too! For most blogs 90 is manageable if you’ve got the technical know-how. They do explain the specific factors fairly well, but sometimes you do have to do further research to figure out the exact implementation. Excellent article and very thorough discussion! Regarding optimizing images, I would like to recommend to concept of sprite and combine multiple images into a single images. That is a good strategy, but I thought it might be a little too technical for the average blogger to tackle. I still haven’t learned how to do that properly myself although I do understand the concept.